The protracted international governance and the fluid policy of peacebuilding and statebuilding brewed local dissatisfaction and local resistance in Kosovo, entrenching local insistence to exercise the right to self-determination and end neo-colonial interventionism. 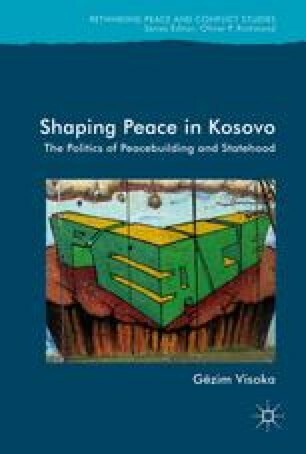 This chapter explores the dynamics of local resistance, the fluid repertoire of contentious politics, and their impact on peacebuilding in Kosovo. The central argument of this chapter is that although local resistance has the potential to counter-balance and challenge the power of fluid interventionism and reduce the popularity of ethno-nationalist structurers, it can also trigger peace-breaking and counter-emancipatory dynamics, thus unintentionally prolonging the ungovernability of peace. Accordingly, this chapter illustrates the importance of speaking truth to resistance as much as speaking truth to power. Baliqi B and Beha A (2015) Intraparty Elections in Kosovo. KAS Policy Brief. Pristina: Konrad Adenauer Stiftung. Available at http://www.kas.de/wf/doc/kas_42090-544-2-30.pdf?150720102458 (accessed 15 April 2016). Gazeta Blic (2015) Rron Gjinovci sqaron incidentin me Vetëvendosjen [Rron Gjinovci Clarified the Incident with Vetëvendosje]. 22 September. Available at http://gazetablic.com/rron-gjinovci-sqaron-incidentin-me-vetevendosjen/ (accessed 07 April 2016). Human Rights Advisory Panel (2015) Opinion on the Case No. 04/04 Kadri Balaj, Shaban Xheladini, Zenel Zeneli dhe Mustafë Nerjovaj. 27 February. Available at http://www.unmikonline.org/hrap/Eng/Cases%20Eng/04_07%20Balaj%20Opinion%20FINAL%20rev2mar15.pdf (accessed 04 July 2016). KohaNet (2016) Diskursi agresiv shpie në përplasje civile [In English: Aggressive Discourse Lead to Civil Clash], Pristina, 26 February. Available at http://koha.net/?id=31&o=1142 (accessed 06 April 2016). Kohavision TV (2016) Rubikon – Fraksion Plus, 12 April 2016. Available at: https://www.youtube.com/watch?v=RfvxwHfT6ig (accessed 12 April 2016). Klan Kosova (2016) Këtë Javë: A po përqahet opozita e bashkuar?, 27 March. Available at: https://youtu.be/LAvFry8C4yM (assessed 27 March 2016). LVV (2010c) Movement’s Manifesto. Available at http://www.vetevendosje.org/wp-content/uploads/2013/09/Movements_Manifesto.pdf (accessed 28 July 2016). LVV (2010d) Short Political Programme. Available at http://vetevendosje.org/repository/docs/Programi_i_shkurte_anglisht.pdf (accessed 22 July 2016). LVV (2013) The Manifesto Principles and Priorities of Lëvizja VETËVENDOSJE! : 100 Points Joined Together by the Changes Necessary for Kosova. Available at http://www.vetevendosje.org/wp-content/uploads/2013/09/Programi_i_shkurte_anglisht.pdf (accessed 23 July 2016). LVV (2015) Report on Republic of Kosova: The Resistance Against a Semi-Authoritarian Regime, 21 October. Available at http://www.vetevendosje.org/wp-content/uploads/2015/10/Report-on-Kosova_Movement-for-SELF-DETERMINATION.pdf (accessed 22 July 2016). Von Laffert B (2016) In Kosovo, if debating doesn’t work throw tear gas, Politico, 03 May. Available at http://www.politico.eu/article/albin-kurti-kosovo-if-debating-doesnt-work-throw-tear-gas/ (accessed 20 May 2016).